Individual Dollar-Based Dental puts you in control of your dental health dollars. The plan is dollar-based. This means you can use your coverage almost any way you choose, with few exclusions and limitations. 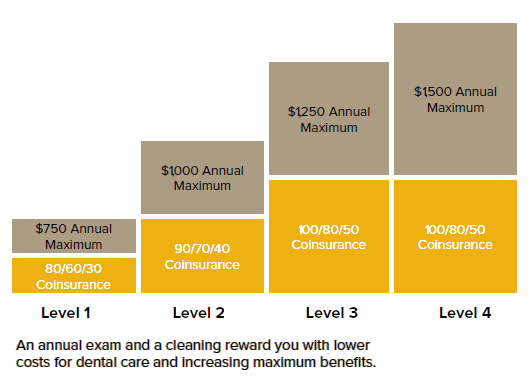 Each year you visit the dentist for an annual exam and cleaning, you’re rewarded with a benefit increase the following year. You decide how to spend your benefit dollars. Each year that you take advantage of an annual exam and cleaning, the benefit dollars available to you increase. The goal is to reach $1,500 in available benefits by year four. Every year the plan pays: 100% of the first $150 of care, 80% of the next $500 of care, and 50% of remaining care until you reach your annual maximum benefit. There is a six-month waiting period for all covered services on this plan. Covered services are those dentally appropriate services or supplies that are required to prevent, diagnose, or treat diseases or conditions of the teeth and supporting tissues. These services must be performed by a dentist or other provider practicing within the scope of his or her license. Orthodontic services, including craniomandibular orthopedic treatment; procedures for tooth movement, regardless of purpose; correction of malocclusion; preventive orthodontic procedures; and other orthodontic treatment. Treatment for an illness or injury caused by a member’s unlawful instigation and/or active participation in a riot, rebellion, war or illegal act.